Patients undergoing cardiac surgery have a high risk to suffer from neurological complications due to small emboli causing only microembolism as well as severe territorial brain ischemia. The purpose of our study was to detect the most sensitive and specific sequence protocol to detect embolic lesions as well as to assess the prevalence of neurological complications in patients undergoing different types of aortic valve replacements (AVR). We examined 24 patients (20 female, 4 male) at an average age of 82 years suffering from an aortic valve stenosis before (mean = 3 days) and after (mean = 8 days) different types of AVR by Magnet Resonance Imaging (MRI) using a Philips Intera 1.5 T system. We acquired FLAIR-, T2- and diffusion weighted transversal images with the following parameters: TR = 10000; 5000; 6230 ms, TE = 140; 100; 73 ms, FOV: 230–250 mm, matrix = 205*256; 307*512; 90*256. Different types of AVR were surgical AVR via sternotomy (3 patients), microinvasive transapical (11 patients), as well as transfemoral catheter based AVR (10 patients). New lesions between the two examinations were counted by two observers in consensus. The sequences using diffusion weighted imaging (DWI) detected most of the new embolic lesions (90) in 14 patients (58%). While with the post-operative FLAIR images only 37 new lesions in 13 patients (54%), with the T2-weighted images only 14 new lesions in 10 (41%) patients were identified. Figure 1 shows an example of positve findings in the different sequences. DWI is the most sensitive method to detect microembolic cerebral lesions in patients which underwent AVR. But the occurrence of microembolic events could be detected in almost all affected patients by FLAIR and T2-weighted images also and can therefore also be used to monitor patients after AVR. Significant differences between the different types of AVR could not be detected. New lesions in the postinterventional (post) MRI could be detected by comparing them to the preinterventional (pre) MRI. 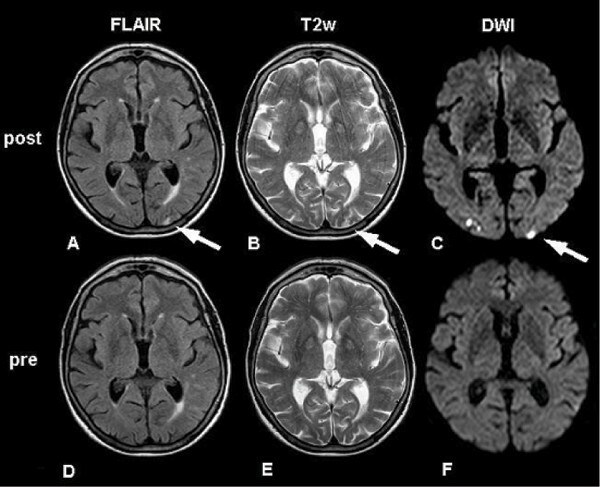 The lesions could be detected best in the DWI sequences (C, F) but also in the FLAIR- (A, D) and T2-weighted (T2w) sequences (B, E). Disregarding the different types of AVR, 58% of the patients did show new lesions.